The Tufted Glider is modern and chic and evokes a feeling of modern elegance in your nursery. This essential piece can easily transition into any room in your home after your nursery. 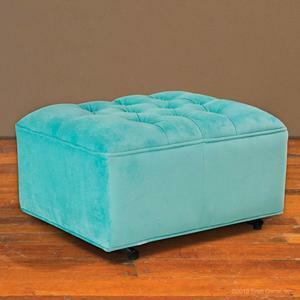 The tufted back creates a designer look that is classic and timeless. The glider has 360 swivel, glides and rocks for maximum comfort. The poly-filled high cushion back and seat creates a medium soft feel for extra support and comfort. The velvet polyester fabric is easy to clean with mild soap and water. Also available in Wheat, Black, and Charcoal. Custom fabrics available: call 888 24-BRATT for details. Available in the following finishes: black, blue, charcoal, wheat. Bratt Decor tufted glider - tiffany blue The Tufted Glider is modern and chic and evokes a feeling of modern elegance in your nursery. This essential piece can easily transition into any room in your home after your nursery. Arm height from floor: 26"
Arm height from seat: 7"
Seat height from floor: 19.25"
Seat back height from cushion: 29"
special features : Swivels, rocks, and glides. I bought this glider from Bratt Decor, however buyer beware, this glider is exactly the same as the Newco International Grand Bella Velvet Glider, which retails for significantly less. I bought the ottoman as well, which even has the Newco International tag in it. You can get the Newco Glider at Target for $459. I love the glider, but would have rather saved the money and bought the same thing from Target. Love this chair, the color is beautiful, the material is soft. It isn't a super plush chair but that's expected with the pintuck back. It's a really great chair, highly recommend if you're looking for a statement piece for your nursery. This is a very cute chair but it is not the color pictured. The actual color is a much lighter aqua blue. Also, the chair was a slighter lighter color than the 'matching' ottoman. If this wasn't a furniture item and was easier to return I would have sent it back. Comfortable, beautiful, and perfect for nursing.